Under the "Presentation" tab in a survey, you can add an option to automatically add numbers to your questions. 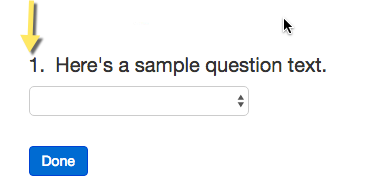 If you chose this option, then numbers will automatically show up in front of your questions. Question numbering can be turned on under the Presentation tab. There you are given the option to "Number question over the entire survey" or to "Number each page of questions separately". "Number questions over the entire survey" means that if you have questions over multiple pages the numbering will continue from page to page. So if you had two questions on page 1 and one question on page 2, the question on page 2 would be labeled "3." "Number each page of questions separately means that if you have questions over multiple pages, the numbering will start over on each page. So if you had two question on page 1 and one question on page 2, the question on page 2 would be labeled "1." because numbering starts over on each page.